We love a good original car wrap design. Yes, new renditions of classic car wraps are cool and all, but there’s nothing like a fresh new design, when done right. How do we begin? At times we will start with a few simple notes based on the clients’ wants. This commonly includes some predetermined color scheme. 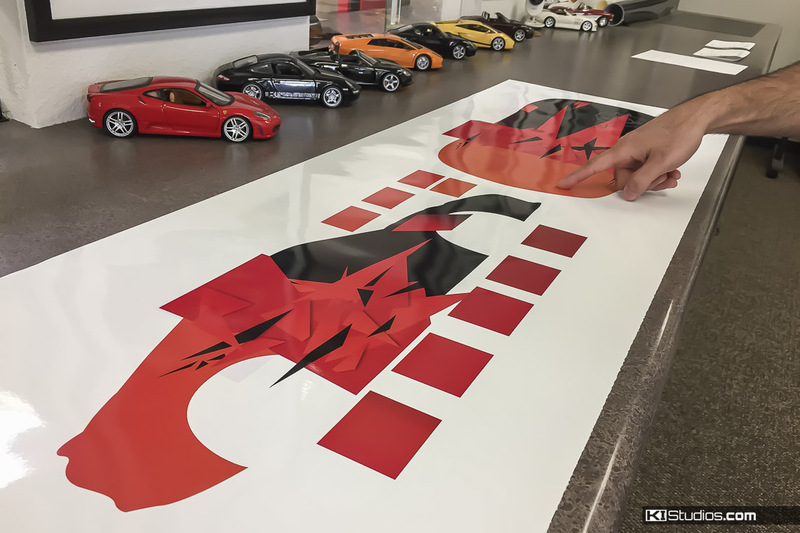 We decide whether the car wrap design will be fully plotter cut, printed or both. A fully plotter cut design traditionally uses cut vinyl and is usually layered to achieve many colors, stripes, logos and text. A printed car wrap design will normally include all its parts and colors within a print on the same layer. However, it is very common on race car wrap designs to use both techniques. Often the main design will be printed in full color and then the sponsor logos and racing numbers applied in the traditional plotter cut method. With that, we have most of the tools we need to get started. The main hurdle when designing a car wrap is based on the fact that you are designing in 2 dimensions for a 3 dimensional object. This is a skill that is necessary if the wrap is to fit and look like it’s supposed to once installed on the car. This skill is not strictly car-based, but is also commonly used in other industries such as graphic design for packaging. The other very important factor is that the design elements need to line up from panel to panel. Remember, each panel on the car is wrapped individually from a few large prints. The design must match up as close as possible where one panel meets the next. The above is precisely the case for the Porsche 981 Cayman GT4 Clubsport featured here. This is the second race car we have designed for this particular client. Car wrap designs for race cars, also known as race car liveries, are great because you can do things that would not normally be done on a street cars. Race livery car wrap designs are usually very wild, very colorful and much more dramatic than most things done for the road. After all, the main purpose of the race car livery is to be noticed on the race track and picked out from the pack. This is not usually the desire on public roads as “noticed and picked out from the pack” can often be best described as police work. Many don’t care and take the risk, but on a race track you don’t have that problem. This one, like most other race car wrap designs, started off with a few mockups. The expectation is you start seeing glimpses of the final product in those early mockups. Once that happens, the design can be elaborated. Some of the design elements we incorporated into this Porsche GT4 Clubsport are based on things we try to always do with race cars, based on functionality. For example, the bumpers are laid out in solid colors. In this case, orange at the back, black at the front. This is not laziness in any away. We make them simple because these parts are usually the ones most often replaced when there is physical contact on the track. If the bumpers are simple solid colors, it makes it a lot more practical to match when it comes time to replace these panels only. We make up for this simplicity on the rest of the car. 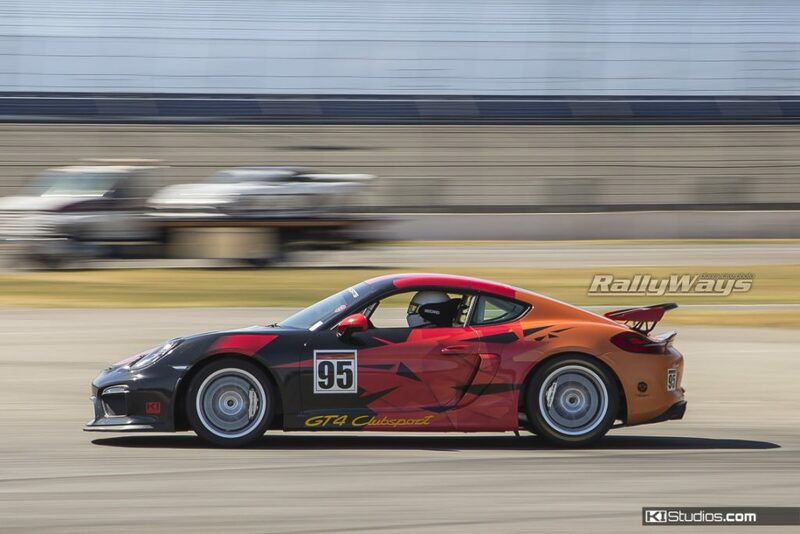 The car wrap design on this GT4 is fully printed in-house. We then laminate it for protection. The design itself incorporates the colors selected in the initial notes. It’s rather abstract, but with very distinct shapes. Abstract designs are great on race cars because it makes lining up body panels way more pragmatic. In the end you end up with a design that’s clean, panels line up nicely and the look is professional and elegant. You can tell the difference between a professionally designed car wrap and one done by a graphic designer that has never designed for the contours of a car body. This GT4 race car wrap design wasn’t even installed at our shop. We designed and printed it in-house and then shipped it for installation at a facility in Northern California. This is a service we offer and do so often. The fact that a wrap will be installed at a different facility further emphasizes the need for a perfectly designed layout. One very important thing we did when outputting this design was we did a bunch of small test prints to make sure we got the colors right. When you print on offset press for paper for instance, color consistency is a lot easier to achieve. When printing digitally, which is the case here, it’s much more difficult to achieve the color you want. What you see on the screen doesn’t usually match what the output print brings along. For this, test prints and color adjustments are almost always necessary. Once we get the color we want, we document it and roll with it. While there are many variables that affect the color of a print, this process allows us the best possible match if a reprint is later needed. I personally photographed the Porsche GT4 Clubsport at California Festival of Speed 2017 just a few weeks after the wrap installation had been completed. The car was racing at the hands of the owner, Laura, during the race weekend. The one very obvious thing to note is that this car stood out from the pack. And not just stood out… It was very obvious this was the best looking car in the group. Yes, anyone can do car wrap designs, but not everyone can make them look the part. 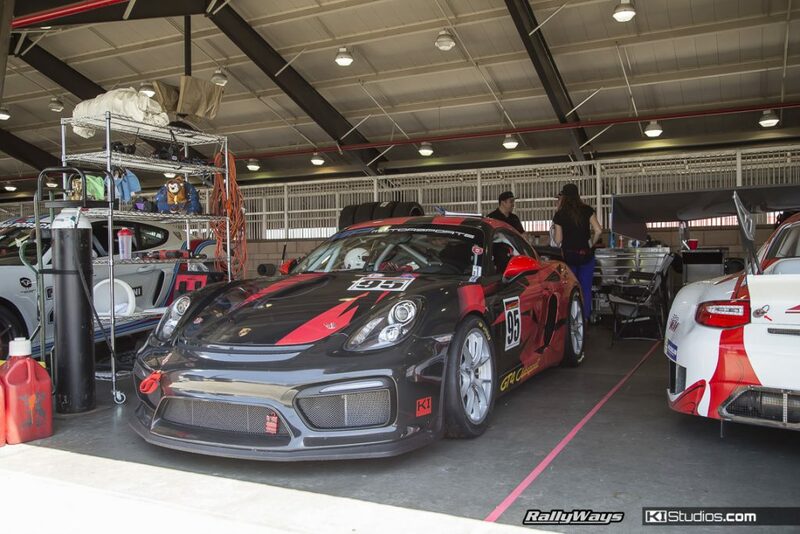 We’re looking forward to seeing this awesome GT4 Clubsport at many West Coast racing events. Photos by RallyWays. To learn more about race car wrap design check out our our race car liveries page. The racing number plates seen on this GT4 can be purchased here for any car: Racing Numbers.